230 pages | 11 B/W Illus. This book seeks to develop our understanding of the contemporary geopolitical reconfigurations of two regions of the world system with high cultural affinity and traditional close relations: Latin America and Europe. Relations between Latin America and Europe have been interpreted generally in the social sciences as synonyms of interstate relations. However, although States remain the most important actor in the geopolitical scene, they have been deeply reconfigured in recent decades, impacted by transnational dynamics, politics and spaces. 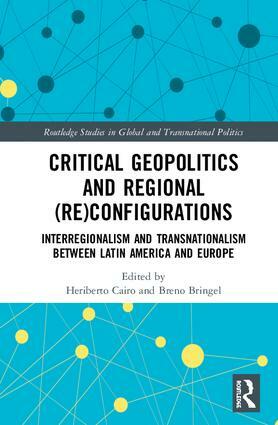 This book highlights interregional relations and transnational dynamics between Latin America and Europe from a critical geopolitics perspective, promoting a new look for interregional relations which encompasses international cooperation and development, global policies, borders, inequalities and social movements. It brings attention to the relevance of interregionalism in the current geopolitical reconfiguration of the world system, but also argues for systematic inclusion of relevant new social actors and imaginaries in this traditional sphere of states. These social actors, particularly social movements and practices of contestation, are developing not only "international" bonds but a new "transnational" field, where networks defy traditional territorial orders. This volume seeks to generate a new discussion among scholars of geopolitics, international relations, social theory and social movement studies by encouraging a development of an interregional and transnational perspective of the two regions. Heriberto Cairo is Professor in Political Sciences at the Universidad Complutense de Madrid, Spain, where he has been dean of the Faculty of Political Science and Sociology. He has published extensively in geopolitics, peace and conflict studies and Latin American integration process. Breno Bringel is Professor at the Institute of Social and Political Studies at the Rio de Janeiro State University, Brazil, where he coordinates the PhD Program in Sociology. He has published extensively in social movements, transnational activism and Latin American thought.